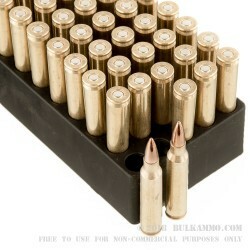 .223 ammo is one of the most popular hunting rounds available on the market. Its small size and low cost make it easy to acquire and store, while its high velocity gives it plenty of accuracy and terminal energy downrange. 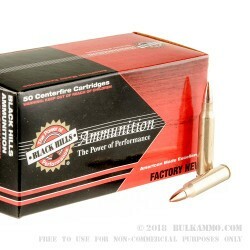 These 55-grain FMJ rounds by Black Hills are perfect for practicing at the range and homing in your aim. All the packaged cartridges are factory new, made to Black Hill’s high-quality standards. The FMJ bullets are a straightforward copper-jacketed lead projectile, designed to provide accuracy and low cost. 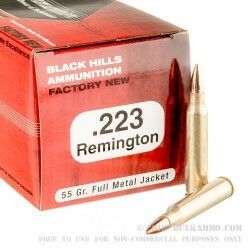 These .223 Remington FMJ rounds by Black Hills travel at 3,200 feet per second and provide 1,250 pounds of muzzle energy. 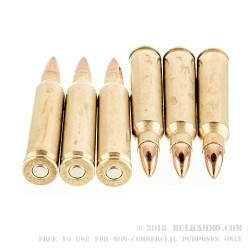 They weigh 55 grains, and their boxer-primed brass casings are safe for reuse.